Councils are warning of a crisis over school places. England is facing a secondary school places "emergency" with more than 130,000 children at risk of missing out on places over the next five years, town hall bosses have warned. In 2023/24, over half of councils in England may be struggling to keep up with demand in their area, according to the Local Government Association (LGA). The school system has been put under pressure in recent years due to a rise in the school-age population. This has been fuelled by a rise in the birth rate in the early 2000s that has now made its way through primary schools and is moving into secondaries. The LGA said that according to its analysis of government figures, by 2023/24, 71 English councils (52%) may not be able to meet the need for 133,926 secondary school places. 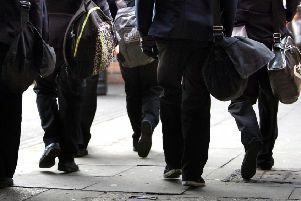 It also said that unless more secondary school places were created, 13 authorities were looking at a shortfall in 2019/20, rising to 25 councils in 2020/21 and 54 in 2022/23. The analysis is based on school places in England in 2016/17 and pupil forecasts up to 2023/24. Councils have created an extra 600,000 primary school places since 2010 to cope with the population boom, but this is now starting to have an impact on secondaries, the LGA said. These places have been created through powers that allow authorities to require council-run schools to expand. In some cases, new places have been created in free schools and academies, which are not under local authority control. But the LGA is warning that two-thirds of secondary schools are academies, which it says makes it difficult for councils to fulfil their obligation to provide enough school places. It is calling on the Government to give authorities powers that would allow them to direct academies and free schools to expand, and to open new council-run schools where required. Councillor Anntoinette Bramble, chair of the LGA's children and young people board, said families should not face uncertainty over securing school places. But she added: "The reality is we face an emergency in secondary school places where the number of pupils is growing at a far faster rate than the number of places available. "This is why councils need to be given the powers to help solve this crisis. As a starting point they should be allowed to open new maintained schools and direct academies to expand. "It makes no sense for councils to be given the responsibility to plan for school places but then not allowed to open schools themselves." Paul Whiteman, general secretary of the National Association of Head Teachers (NAHT), said: "The lack of school places is an issue which isn't going away. The massive increase in pupil numbers over the next few years, particularly at secondary age, will only make it harder. "Integrated local planning of school places across maintained, academy and free schools is vital to ensure sufficient provision in all areas of the country. "Local authorities are responsible for ensuring sufficient school places but the powers and resources necessary to do so have been removed. They are unable to require academies to expand, for example. "In an increasingly fragmented school system we lack a co-ordinated approach to place planning. Instead it's haphazard; decisions are being made in isolation and new schools and new school places are not always being commissioned in the areas they are most needed."